Background: Nanotechnology has gained a great deal of public interest due to the needs and applications of nanomaterials in many areas of human endeavours such as industry, agriculture, business, medicine and public health amongst many others. Polymeric nanoparticles from biodegradable and biocompatible polymers are good candidates for drug carrier to deliver the drugs because they are expected to be adsorbed in an intact form in the gastrointestinal tract after oral administration. Objective: The objective of the study was to investigate the influence of some precarious variables like, concentration of chitosan, concentration of sodium tripolyphosphate (STPP) and stirring time on physicochemical characteristics of lycopene loaded chitosan nanoparticles. Method: Eight batches of lycopene loaded chitosan nanoparticles were prepared using various concentrations of chitosan (100-200 mg), STPP (50-100 mg) by varying stirring speed in the range of 10-20 minutes using ionic gelation method. 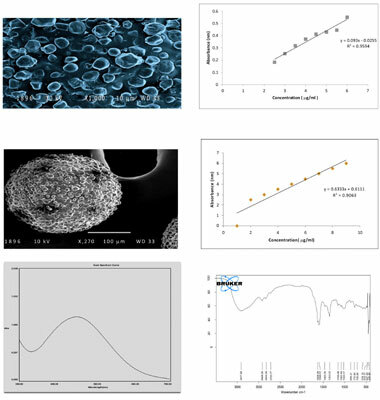 The optimized nanoparticulate formulation was characterized for various parameters like morphology study, particle size and size distribution studies, differential scanning calorimetry, entrapment efficiency and in-vitro drug release studies. Results: Lycopene loaded chitosan nanoparticles containing 150 mg of chitosan, 75 mg of STPP, 20 mg of drug lycopene and with 15 min of stirring time showed entrapment efficiency of 89.4%. The percent release of lycopene loaded chitosan nanoparticles at the end of 6 h was found to be 83.5%, however, percent release of pure lycopene at the end of 6 h was observed as 79.6%. Conclusion: Lycopene loaded chitosan nanoparticles may show a great promise for the development of drug delivery system by enhancing the cellular accumulation of lycopene with chitosan. Chitosan, ionic gelation method, lycopene, nanoparticles, sodium tripolyphosphate (STPP), nanotechnology.